LONDON, England (CNN) -- As the clock ticks down to the 81st Academy Awards Sunday, audiences could be forgiven for losing interest. On the face of it, apart from Hugh Jackman hosting, this year's Oscars doesn't look like it will offer many thrills. 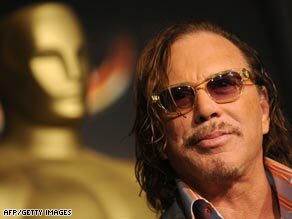 Sure thing: Pundits are saying that Mickey Rourke is almost certain to pick up the Best Actor Oscar for his role in Darren Aronofsky's "The Wrestler." Sure, the once-yearly opportunity to poke fun at an ill-judged Oscars dress or a super-gushy acceptance speech (gather, Kate, gather) is a welcome prospect in these dreary days of economic doom and gloom. Unless there are any major upsets, Danny Boyle's "Slumdog Millionaire" -- the sleeper hit that has become a worldwide phenomenon -- will probably take away the golden statue. Other favorites to nab a statuette, according to Avello, are Kate Winslet for Best Actress, Mickey Rourke for Best Actor, and Heath Ledger for Best Supporting Actor. If he wins, will be only the second actor to receive the honor posthumously. The other was Peter Finch in 1977. Nevertheless, things may not be as clear cut as some are suggesting. "The Curious Case of Benjamin Button," which stars Academy favorite Cate Blanchett and Brad Pitt could cause some upsets for "Slumdog." David Fincher's film has been almost completely ignored for any big prizes so far this awards season, but has 13 nominations from the Academy. Best Picture and Best Director usually go to the same movie, but it is possible the Academy could split them between crowd-pleaser, "Slumdog" and "Benjamin Button" this year. As actors are strongly represented in the Academy, "Benjamin Button" could snare a Best Director gong for Fincher for producing strong performances from Blanchett and Pitt. However, it will be hard for the Academy to ignore the logistical difficulties Danny Boyle had to overcome shooting in the slums of Mumbai. "Benjamin Button," a noughties update of "Forrest Gump" could also pick up an Oscar for Best Adapted Screenplay for Eric Roth who won the accolade for "Forrest Gump" in 1995. There's also all to play for in a strong Best Supporting Actress category: Amy Adams and Viola Davies who both give excellent performances in "Doubt" -- particularly stage actress Davies who delivers a scene-stealing performance across from Meryl Streep at the film's climax -- could cancel each other out. If Mickey Rourke is successful for "The Wrestler," it could mean Marisa Tomei loses out which could mean a repeat of Penelope Cruz's BAFTA win for her performance in Woody Allen's Barcelona-based rom-com "Vicky Cristina Barcelona." Best Foreign Language film is always a good source of debate -- not least because only one film can be submitted per country. If a country is having a strong year cinematically, great films may lose out on their chance before the competition starts. One of this years' major surprises is that Matteo Garrone's astonishingly gritty Mafia movie, "Gomorrah," which won the Grand Prize at Cannes in 2008 and which was Italy's submission was not shortlisted by the the Academy. Some critics have been extremely scathing about the Academy's treatment of foreign language films. "It's difficult to say what the furrin-film Oscar measures," spits Andrew O'Hehir on the Beyond The Multiplex Blog on Salon.com,"other than providing readings from an especially eccentric focus group." Among the films that were nominated, everyone expects Laurent Cantet's semi-improvised school drama "The Class" which won the Golden Palm at this year's Cannes to take away top honors here. The other main contender is Ari Folman's inventive animated documentary "Waltz with Bashir." So, we'll have to wait and see if all will go as predicted or if the Academy has some surprises up their sleeve. Let's hope it will be more sizzle than snooze.